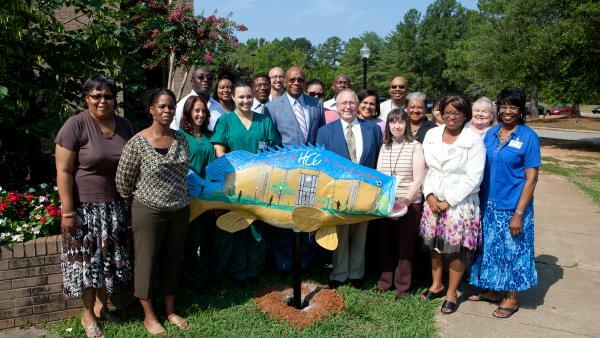 HCC recently released the campus’ Roanoke Valley rockfish, designed by Advertising & Graphic Design instructor Johnnie Rascoe and painted by Advertising & Graphic Design student Anthony Peters. The front of the fish features the iconic main campus building 100, and the back of the fish features The Centre and other campus buildings with silhouettes of students milling about. The slogan painted on both sides of the fish is, “Learning Comes to Life…HCC… In Pursuit of Excellence.” HCC was chartered in 1967. The campus comprises 109 acres, eight buildings and three off-campus centers. The college is accredited by several institutions, including the NC State Board of Community Colleges, the NC Board of Nursing, and the American Dental Association to name a few. Current enrollment is more than 1700 curriculum students and over 5700 continuing education students. HCC employs more than 160 full-time and nearly 200 part-time faculty. Associate in Arts, Associate in General Education, Associate in Science, and Associate in Applied Science degrees are offered in Accounting, Advertising & Graphic Design, Automotive Systems Technology, Nursing, Basic Law Enforcement Training, Business Administration, Computer Information Technology, Cosmetology, Criminal Justice, Dental Hygiene, Early Childhood Education Teacher Associate, Electronics Engineering Technology, Facility Maintenance Worker, Food Service Technology, Greenhouse & Grounds Maintenance, Human Services Technology, Industrial Systems Technology, Interior Design, Medical Laboratory Technology, Medical Office Administration, Network Technology, Office Systems Technology, Paralegal Technology, Plumbing, Small Engine & Equipment Repair and Welding.